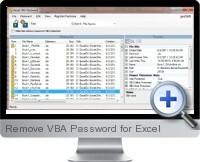 Remove VBA Password for Excel can unlock protected VBA projects within Microsoft Office documents by either removing or resetting the protection password. VBA passwords can be removed for all Office application documents that support VBA macros including Excel, Word, Access, PowerPoint and Project. Either change to desired password or remove passwords of protected VBA project modules. Supports all versions of Microsoft Office including 97, 2000, 2002 (XP), 2003, 2007 and 2010. Ability to recover, reset and remove any type of password in any language. Command line support enables the removal of VBA passwords on multiple documents in batch mode. Includes a 30 day full refund guarantee with no criteria. Passwords are securely removed without damage to files and backups are automatically created. An additional utility can search for duplicate files that have identical contents and remove them to free up disk space.